An underrated killer, hotter than the surface of the sun. That’s how the National Weather Service (NWS) describes lightning, which, over the past 30 years, has been responsible for an average of 47 deaths per year. 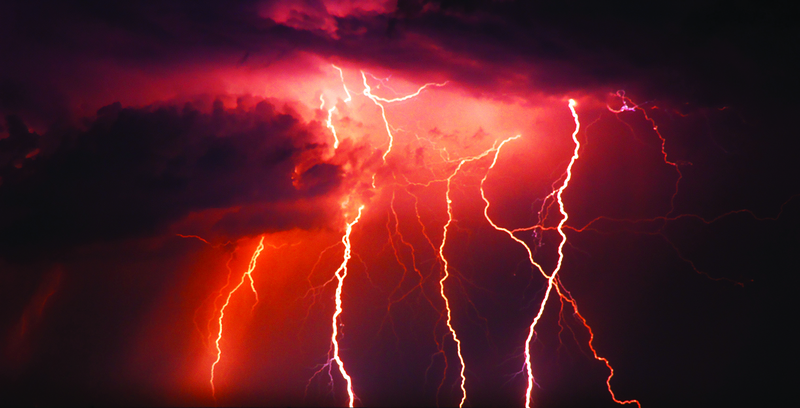 According to the NWS, lightning strikes the United States about 25 million times each year. Although most strikes occur in summer, lightning can occur at any time of year. Since farmers work outside frequently, they are at greater risk for lightning injury and death than the average population. “When thunder roars, go indoors!” That’s the mantra NWS Lightning Safety Specialist John Jensenius uses when promoting lightning safety. The science of lightning is, well, complicated. But the safety aspect of lightning: just get inside a building or vehicle once thunder occurs or lightning strikes appear. When you see a thunderstorm developing, don’t wait to hear thunder before taking shelter. Lightning can strike 10 miles or more in the area surrounding a thunderstorm. Nearly anything can be struck by lightning, including human beings. An average bolt of lightning, striking from cloud to ground, contains roughly 1 billion joules (unit of work or energy), enough to power a 60-watt lightbulb for six months and cool a refrigerator with an open door for 24 hours. Heat lightning doesn’t actually exist. When you see flashes of lightning, they’re coming from a distant thunderstorm, which is far enough away you can’t hear thunder. The same shockwaves may be strong enough to blow holes in plaster walls, shatter glass, create a trench in the soil and crack foundations. Shrapnel from demolished items can also cause damage to people and property.